Sunroom looks like the morgue on CSI Miami. But alas, I am not covertly running a suburban slaughterhouse. 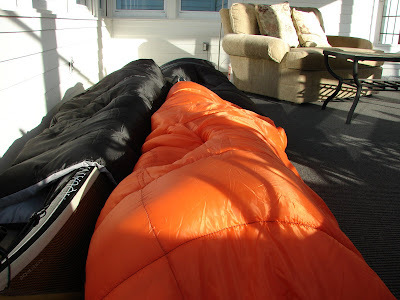 The giveaway is the nose of a snuggly kayak segment peering out from the nylon sleeping bags. One huge advantage to the sectional 3-piece kayak is the ability to store it in places where an 18 foot single-piece simply will not fit. I have a standard screen door to enter the sunroom, and the length of a single piece would prohibit it from entering the room easily. Catching wind and banging around would harm the boat; leaving it stretched across the entire sunroom would interfere with margarita-themed summer cocktail parties. 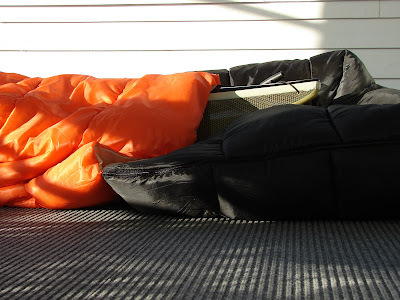 Solution: sectional three piece sea kayak, stacked sweetly to one side of the sunroom. Protected from the elements and out of the way for safe keeping. Let the party begin! These comments were SPAM. I can't believe it. Blogger sales spam! What is this dreadful world coming to? Ok...it may not work, but at least I feel better! Cool idea using sleeping bags for protecting the sections! !